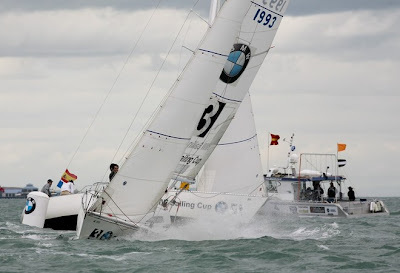 SAILKARMA.COM - Sailing News, Videos and Photos! 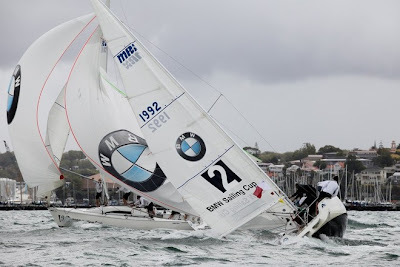 : BMW Sailing Cup World Final 2010: Semi-Finals underway. BMW Sailing Cup World Final 2010: Semi-Finals underway. The wind gods in Auckland, New Zealand continued to raise the challenge for the seven international crews competing in the BMW Sailing Cup World Final 2010 today, with winds gusting over 30 knots testing their skills to the limit. Today saw the beginning of the match race section of the regatta, starting with the teams who placed 4th to 7th in the fleet racing competing in a sudden death round robin. This was to establish the fourth semi-finalist, as the top three teams – New Zealand, Italy and Malta – had progressed directly from the fleet racing to the match race semi-final. Germany and Hong Kong were first eliminated, leaving European neighbours Spain and Portugal to do battle for that sought-after semi-final slot. Portugal won the match and, as a big squall raced down the harbour, the yachts were sent ashore for the semi-final boat draw, presided over the BMW New Zealand CEO Mark Gilbert. As teams sheltered in the Royal New Zealand Yacht Squadron, Lauro Perfectua, skipper of the Hong Kong team reflected on the regatta. "We have enjoyed the experience," he said. "This was the first time we sailed in New Zealand. "We really needed less wind. Our crew weight was too light for these conditions. We are all small guys and these are bigger boats than we are used to." Also wishing the conditions had been lighter were the German team, who do most of their sailing on inland lakes. The German team was selected after the winners of 19 regional regattas sailed off against each other at a lake south of Munich, surrounded by snow-capped mountains. "In both the Berlin finals and the German finals, we sailed in winds of zero to two knots," said skipper Jörn Pietsch. "It was a bit of a shock to come here, but we have enjoyed the racing very much." Back out on the water, Team New Zealand, as top place-getters in the fleet racing had the right to choose their semi-final opponents and elected to race against Team Malta, leaving the Italian and Portuguese teams to do battle. Portugal was penalized in a pre-start incident, but came from behind to win the first match when the Italian team dropped their spinnaker in the water and sailed over the top of it. They failed to finish the race, leaving the Portuguese to sail around the rest of the course on their own. "It was not bad luck, it was a big mistake," said Italian skipper Jacopo Pasini." In the other match, Team Malta received a penalty for failing to keep clear of Team New Zealand in a pre-start duel. However, Team Malta sailed strongly up the first beat in strong winds to narrowly lead around the first windward mark. On the downwind leg, however, with the two boats close alongside each other, the Malta team lost control and broached, allowing Team New Zealand to jump clear and lead around the course by a comfortable margin. Race Director Russell Green said that because of the weather conditions, the semi-finals had been reduced to the first to win two matches. Because of the squalls today, the racing was cut short, but Green said: "We will try to complete the semi-finals tomorrow if there is enough time and then we will proceed to the match race final."